Plovdiv, Bulgaria - Current News - Is Plovdiv finally ready to create a house museum to the famous Plovdiv artist Tsanko Lavrenov? Or not yet? Is Plovdiv finally ready to create a house museum to the famous Plovdiv artist Tsanko Lavrenov? Or not yet? The grandson of the eminent artist Tsanko Lavrenov, Lavren Petrov, an art theory and history expert and Chairman of the "Tsanko Lavrenov Foundation", is trying to schedule a meeting with the Plovdiv Mayor, Slavch Atanassov, to discuss the possibility of creating a new, larger house museum to the great Bulgarian artist. 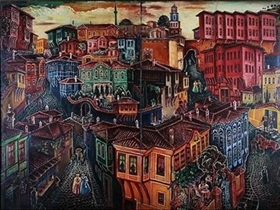 Currently, the Tsanko Lavrenov Permanent Exhibition, consisting of precious 42 works, is being housed on the second floor of the Mexican Graphics Art Gallery House in the Old Town of Plovdiv, which does not properly reflect the scale of the artist's work and his multifaceted personality. The artist's grandson has not lost hope that the collection of works by Tsanko Lavrenov will one day find a proper home in the Old Town of Plovdiv. Plovdiv authorities have promised to Tsanko Lavrenov himself in 1976 that his works will be located in a special house-museum that would be built especially to serve that goal. But 34 years later, this most valuable collection of paintings is still homeless. The initial choice of the city authorities for such a house museum from more than 30 years ago was on Suborna Street, in the foot of the Old Town - when the house was under construction, it was even decorated with a special sign informing that this would be the future location of the Tsanko Lavrenov House Museum. A little later, the sign was mysteriously taken off and ...yes, that house did chang its initial purpose. So, is Plovdiv finally ready now to pay tribute to one of its greatest artists?